Record your midi performances using this audio unit in your DAW then save/export them as standard midi files via email or directly to other apps. 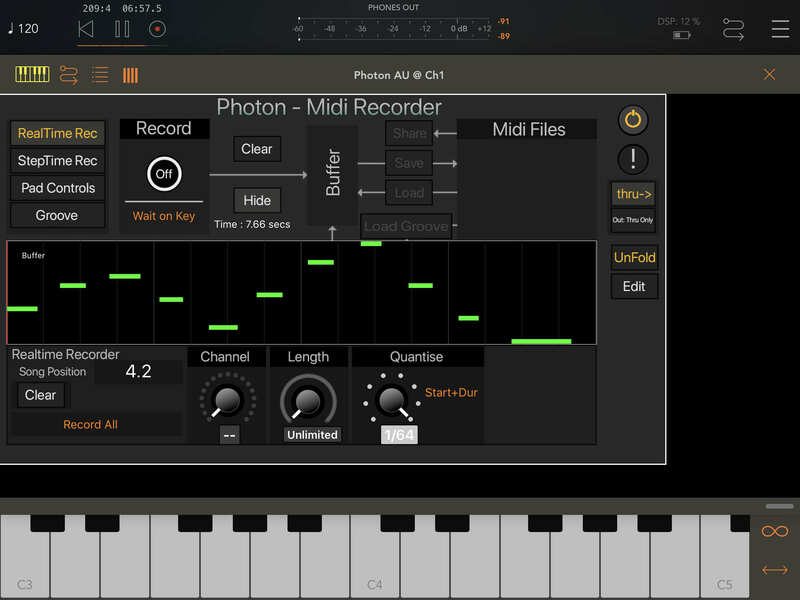 "Designed & Developed by Tony Saunders based on requests in the Audiobus forum users." @midiSequencer Currently having problems saving after recording in real time midi in AUM. Been following the manual. When I come to hit SAVE the button is greyed out? Can you help please. See screenshot. @Jumpercollins Did you try to touch the header "Midi Files" first? All sorted realised I had to hit the show/ hide button. Will be up and running proper once I watched a few videos. I think a few quick action buttons would make this app maybe better for first time casual users once you recorded a midi file you just want to hit a play button to hear it play back. ie PLAY, SEND to PAD buttons would make this instant usable. I’m finding the UI a bit confusing but it’s early days. @midiSequencer Many thanks for a fab midi AU app, managing to create some lovely evolving patterns now with just a few apps. Can see this app getting a lot of use. My only criticism now is the rotaries are jumping around a bit for precision control will you add a setting under app settings to give use the usual duel options ie Linear or Rotary. how can record a midi sequence on the fly then automatically start the playback (or start playback using using a remote control if it’s impossible otherwise). Didn’t find how to quickly playback my records. Best place for us devs to get ideas! You guys know what you want!! I loaded some pattern into Pad1. I then closed AUM. When I returned later and opened previous session, there was nothing on the Pad. I would have expected this to be saved with the state, but it doesn’t seem to be the case? 2.How do I do real time recording of a backbeat pattern, that when played back in a Pad stays in synch say with a Rozeta drum pattern also played in AUM. No matter what I do Photon seems always to start at the beat.. Somehow it should be possible to do a recording that is aligned with start of bar, but begins with a rest, without having to step record? The rotating controls are horrible, indeed. Cannot remember any app doing it this way, with circular instead of linear movement required. And please also fix the fine control, the stock controls just does not work, never ever. Trying to set the Velocity exactly just does not work, as with so many Apps. Is anyone else having a problem with syncing to the beat in AUM. With the pad playback set to “Play Now’ it works and loops fine keeping to tempo. If you set it to start on Bar or Start on Beat then the timing goes out. It seems to be running slower than the clock so that when it gets to the end of the bar, it waits till the start of the next bar before starting the loop again. Maybe it’s me! Have tried lots of different things including re-install still nothing. At the moment there is no record to autoplay, you need to record, stop recording(length does this automatically), then assign to a pad(which has autoplay on load setting). I see the need to have this auto audition feature so will add that in the next update. Im not aware state saving includes large data like wavs or midi files? If someone knows of an app that does this I will include. Otherwise saving 5 buffers which could contain up to a million midi events might be a challenge. Each pad has a setting to start - inmediately, on the bar or beat. These relate to the host transport. I am having this problem too. I’ve only tested in AB3 so far. How to play back at the speed I recorded in? I just recorded some notes, assigned them from buffer to pad 1 and played it, it was much faster than what I played in. I need to add that I did not read the manual yet, but was expecting the playback at the same speed, as with other MIDI recorders or DAWs. You can toggle linear behavior on and off by tapping the app title. There’s no visual indication that anything has happened, but the behavior changes. It seems not to remember the choice though. I keep finding myself back in rotary mode. Looks like i might be resyncing every loop and its missing the bar/beat change. it should really just do this to start, so will look at this. I also noted that some text that I expected to be just text, is indeed a button! Of course a visual indicator about what's a button and what's not, would be helpful. Most buttons have this already, but not all. playback speed should be the same. You can change speed with host bpm or tempo div settings. I’ve quantized, trimmed, set bar length, etc, and it doesn’t help. It happens with known length imported midi files too. It seems like sometimes it thinks the loop is just a little longer than it really is, so it has to wait for the next beat or bar to roll around before triggering again. Or maybe it’s the other way around - it’s misinterpreting the host beat / bar end. It doesn’t happen every loop. Sometimes it gets it right 3 or four times before going out of sync. Sounds to me like you’ve nudged the Tempo Div. it should be at 1/1. Understand that you can’t save the whole Midi content as state, but couldn’t you save the content as a file automatically, and the state is just a reference to the file? It even happened to me that the plugin frooze, and when Aum reloaded it, everything was lost. Having to manually keep saving to file is a workflow killer to me! Don’t work in GarageBand ? Yes it is possible, Spacecraft AU does this with large wav files. Not sure how he managed it though. I would love to see this if possible as that's how I'd arrange parts in sequences together, rather than having to load up parts each time I load an AUM session etc. anyway current version is still excellent.